The Commonwealth of Learning, is not at this time without Master-Builders, whose mighty Designs, in advancing the Sciences, will leave lasting Monuments to the Admiration of Posterity; But every one must not hope to be a Boyle, or a Sydenham; and in an age that produces such Masters, as the Great – Huygenius, and the incomparable Mr. Newton, with some other of that Strain; ’tis Ambition enough to be employed as an Under-Labourer in clearing Ground a little, and removing some of the Rubbish, that lies in the way to Knowledge (Essay, ‘Epistle to the Reader’). Locke regarded his project as the work of an under-labourer, sweeping away rubbish so that the ‘big guns’ could continue their work. But what is it that unites Boyle, Sydenham, Huygens and Newton as Master-Builders? It can’t be the fact that they are all British, because Huygens was Dutch. It can’t be the fact that they were all friends of Locke, for when Locke penned these words he almost certainly had not even met Isaac Newton. Nor can it be the fact that they were all eminent natural philosophers, after all, Thomas Sydenham was a physician. In my book John Locke and Natural Philosophy, I contend that what they had in common was that they all were proponents or practitioners of the new experimental philosophy and that it was this that led Locke to group them together. In the case of Boyle, the situation is straightforward: he was the experimental philosopher par excellence. In the case of Newton, Locke had recently reviewed his Principia and mentions this ‘incomparable book’, endorsing its method in later editions of the Essay itself. Interestingly, in his review Locke focuses on Newton’s arguments against Descartes’ vortex theory of planetary motions, which had come to be regarded as an archetypal form of speculative philosophy. I hope the age has many who will follow [Sydenham’s] example, and by the way of accurate practical observation, as he has so happily begun, enlarge the history of diseases, and improve the art of physick, and not by speculative hypotheses fill the world with useless, tho’ pleasing visions (1 Nov. 1692, Correspondence, 4, p. 563). Note the references to ‘accurate practical observation’, the decrying of ‘speculative hypotheses’ and the endorsement of the natural ‘history of diseases’ – all leading doctrines of the experimental philosophy in the late seventeenth century. So, even though Sydenham was a physician, he could still practise medicine according to the new method of the experimental philosophy. In fact, many in Locke’s day regarded natural philosophy and medicine as forming a seamless whole in so far as they shared a common method. It should be hardly surprising to find that Locke held this view, for he too was a physician. If it is this common methodology that unites Locke’s four heroes then we are entitled to say ‘Locke’s Master-Builders were experimental philosophers’. I challenge readers to come up with a better explanation of Locke’s choice of these four Master-Builders. In a recent conference paper I have argued that in some key respects Galileo’s natural philosophy anticipates the experimental philosophy of the later seventeenth century. I am not claiming that Galileo uses the term “experimental philosophy.” Nor do I claim that he makes any distinction comparable to that between experimental and speculative natural philosophy. His Italian followers in the Accademia del Cimento would later do so, but he does not. Nonetheless, the way in which Galileo undertakes natural philosophy displays at least two of the features that Peter Anstey and his collaborators have argued are characteristic of experimental philosophy. Galileo's sketch of a device to demonstrate the power of a vacuum. Perhaps more importantly, Stephen Gaukroger has argued that experimentation shaped the very way in which Galileo’s physical theories are framed and formulated. Alexander Koyré and others have argued that the laws of Galilean physics are “abstract” laws which refer to an ideal reality. It is true, of course, that in setting aside “impediments” (impedimenti), such as the resistance of the air, Galileo’s proofs do not refer to the world of everyday experience. But it is unhelpful to think of them as an idealisations of, or abstractions from, experienced reality. There is an experienced reality to which they conform. It may not be that of everyday experience, but it is that of carefully controlled physical experiments. It follows that in Galileo’s work, the task of natural philosophy is being rethought. It is no longer the study of reality as revealed to everyday observation; it is the study of that reality revealed in experimental situations. The second way in which Galileo’s natural philosophy anticipates the later experimental philosophy is in its comparative lack of interest in the mechanisms thought to underlie phenomena. It is not that Galileo was a positivist in our modern sense. There are passages in which he engages in speculation regarding matter theory and on these occasions he favours a corpuscularian view. But such speculations are, as Salviati says in the Two New Sciences, a mere “digression.” Galileo does not consider that his new science requires them. Indeed his work on motion is almost entirely a kinematics – as he freely admits, it says nothing about the causes of motion – but Galileo does not consider it any less significant as a result. 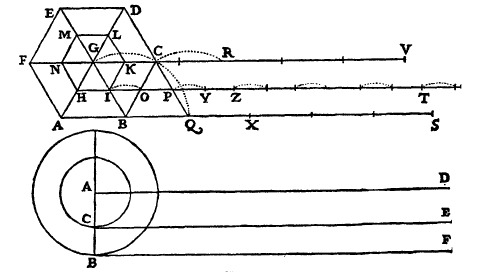 Galileo's solution of the "rota Aristotelis" paradox, demonstrating that a body could be composed of an infinite number of unquantifiable atoms. This should not be interpreted as a general lack of interest in causation, as Stillman Drake suggests. Galileo shares the ancient desire cognoscere rerum causas (to know the causes of things). But the causal properties Galileo seeks are different from those sought by his predecessors. His causes are the mathematically describable properties of the objects whose behaviour is being explained, properties that no Aristotelian would regard as essential. (Even his atoms are more akin to mathematical points than physical objects.) It is, once again, experimentation that allows us to pick up which of those mathematically describable properties are generally operative and therefore the proper subject of a science. It is this move that allows Galileo, as it would later allow Newton, to be content with a causal account that remains on the level of phenomena, rather than speculating about a realm inaccessible to observation. In an early dialogue, Galileo has two rustics (contadini) speculating about the new star of 1605. One of them advises his companion to listen to the mathematicians rather than the philosophers, for they can measure the sky the way he himself can measure a field. It doesn’t matter of what material the heavens are made. “If the sky were made of polenta,” he says, “couldn’t they still see it alright?” This is surely something new in the history of natural philosophy. While I would still defend the individual claims contained here, my continued study of Galileo has made me increasingly cautious about the usefulness of a distinction between experimental and speculative natural philosophy. It is certainly the case that many late seventeenth-century thinkers made such a distinction, but is it a useful one for us to make? I’m not confident that it is. Experiment certainly played an important role in Galileo’s work, although precisely what that role was continues to be contested. And it is true that Galileo has little interest in speculating about the underlying structure of the world: even if, as he writes, the sky were made of polenta, the mathematicians could still measure it. The problem is that the classical, mathematical tradition out of which he comes — that of astronomy, statics, optics, and (after Galileo) the study of local motion — cannot be helpfully characterized as either experimental or speculative. It certainly uses experiment, but it also reasons a priori, in ways that seem independent of experience. So perhaps it would be better to have a threefold classification of early modern scientific traditions. (A classification of this kind is suggested by Casper Hakfoort in the last chapter of his Optics in the Age of Euler.) A first tradition would be that of matter theory, which is inevitably speculative insofar as it deals with matters not accessible to direct observation. (This is the realm of Newton’s “hypotheses.”) Corpuscularian proposals would fall into this category, as would Descartes’s vortex theory. A second tradition would be that of experimental natural philosophy, which regarded the results of experiment as themselves significant forms of knowledge, whether or not they could be connected with an underlying theory of the nature of matter. Finally, there is the mathematical tradition that Galileo transformed, so successfully, by producing a mathematical account of local motion. Individual natural philosophers could engage in all three kinds of activities, but will differ according to the emphasis they place on one or other of them. So although Galileo certainly engaged in experiments, his emphasis was on the kind of reasoning characteristic of the mathematical tradition. It is this form of reasoning, I have come to believe, that cannot be easily fitted into the experimental-speculative scheme. Attendance at the symposium is free. However, space is limited, so we advise you to register early. To register and for information, please email peter.anstey@otago.ac.nz. Abstracts of all papers are available here. If you cannot attend, but would like to read some of the papers, send us an email.